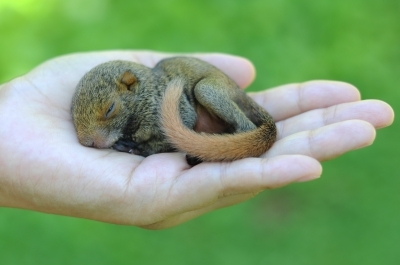 These are the “wild baby” days, when while on a hike in the woods, a walk in the park, or tending your own lawn, you might come across wild animal babies. Often it looks like these babies have been abandoned by their parents but generally that is not the case. Many wild animals will leave babies in the nest or hidden for hours at a time while they feed elsewhere, and by interfering with their method of parenting, we can greatly reduce the babies’ chance of survival. Unless you are absolutely certain the parent(s) are dead, it’s best to leave the babies alone. If you are uncertain, wait nearby and give the animals a chance to reclaim their young. If after a reasonable amount of time that doesn’t happen, the next best thing you can do is to contact your local Animal Control (Berrien County is at 269-471-7531.) and they can put you in touch with a wildlife rehabilitator or they may ask you to bring the babies in to the shelter. They can also guide you in the best way to handle the young. If you check with the Berrien County Animal Control website, http://www.berriencounty.org/AnimalControl, you can find a very helpful brochure on Wild Babies: Helping them Survive! The brochure has a wealth of information on how different wild animals care for their young and how to best determine if intervention is really necessary. I printed it out and will keep it, in case I’m ever faced with the decision of what to do with and how to handle wildlife babies. I figure it’s best to educate yourself ahead of time, especially when you live in an area that is as rich in wildlife as Michigan.